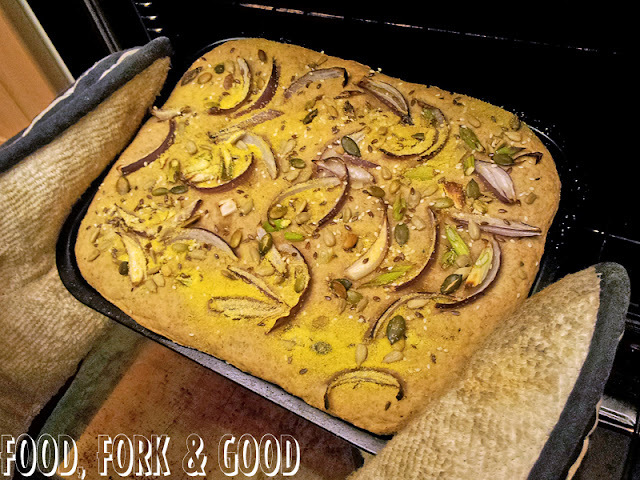 Step-by-Step: Focaccia bread - Fork and Good. 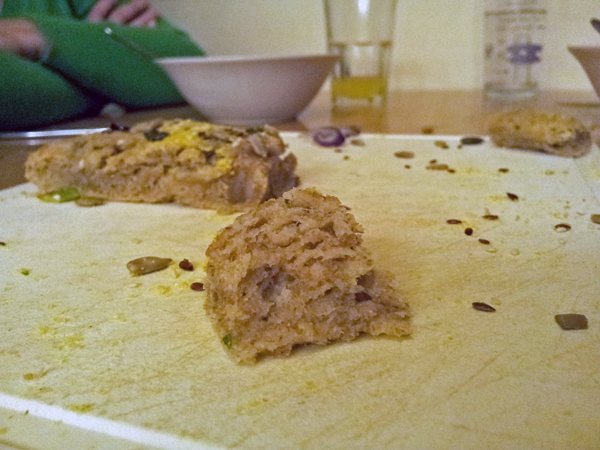 I think I've said it before, but making bread is one of my favourite things to do at the moment. Programmes like this don't help but fan the flames of my obsession really. Along with cooking confectionery like fudges, toffees and marshmallows it's one of the only things I feel the need to properly follow the recipes for. 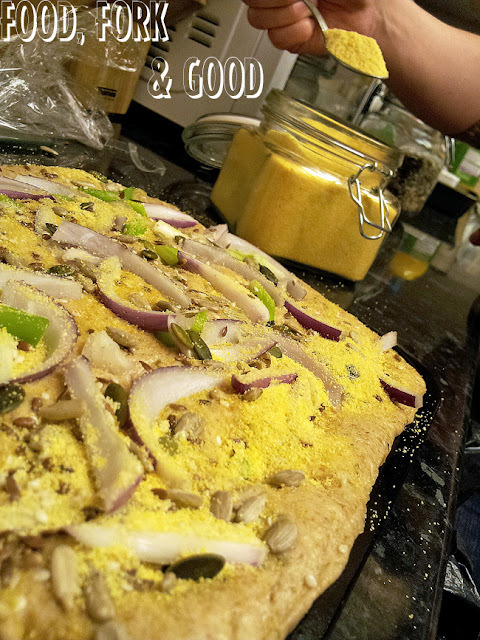 I got a basic foccacia bread recipe from my old cook book, a massive door stop of a read that's over a foot thick & has all the basic knowledge of all cooking, preparing & baking in it. I love that book. In a large bowl, place the flour, yeast, sea salt, sugar & oregano. Mix well. In a jug, add the olive oil to the warm water. 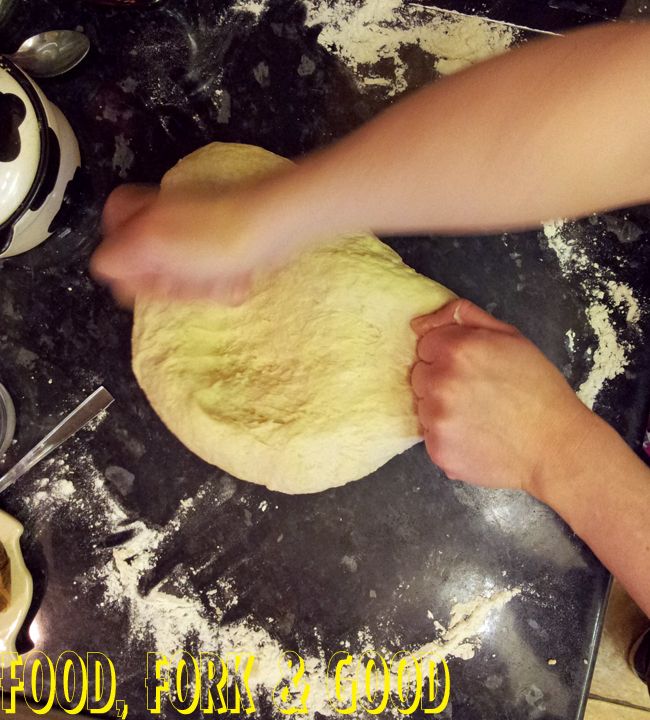 Make a well in the flour and gradually mix the water/oil mix in to form a soft dough. 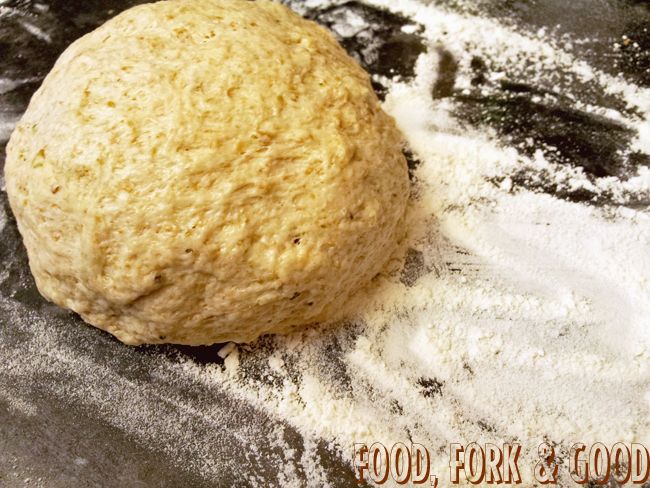 Knead for 10-15 minutes, stretching out the dough until it becomes elastic & smooth. Place it in an oiled bowl, and cover with cling film. Place in a warm area and leave until it doubles in size. This usually takes between 45 minutes and 2 hours depending on the heat of where it's resting. Once it's risen, with floured hands remove from the bowl and knead the dough again for 3-4 minutes until it's smooth and elastic again. This is to knock out excess air before proving. 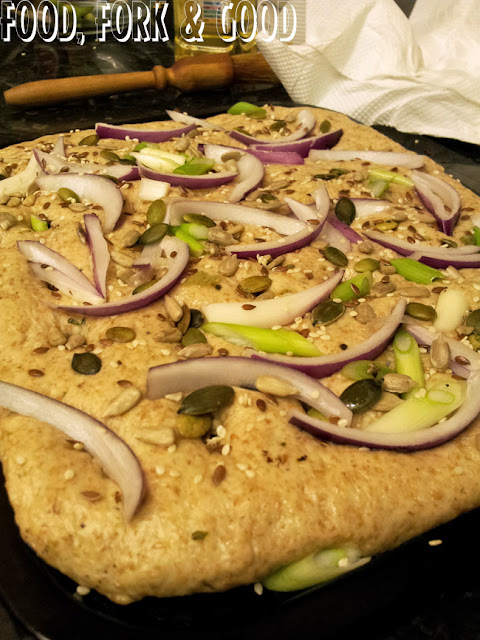 Using a floured rolling pin, roll the dough so it's even and shape it to a rectangle before setting it on an oiled baking tray, covering with loose oiled cling film and setting aside for another 45 minutes in a warm place to rise again. Once risen, make indents in the dough like the above picture, then brushing liberally with oil. I used Olive oil, but you can literally use any. Herb & chilli infused oils go really nicely, so do some nut oils & seed oils. Next top it with whatever you fancy, I've topped mine with sliced red onion, spring onion, sunflower seeds, pumpkin seeds, linseed, sesame seed. 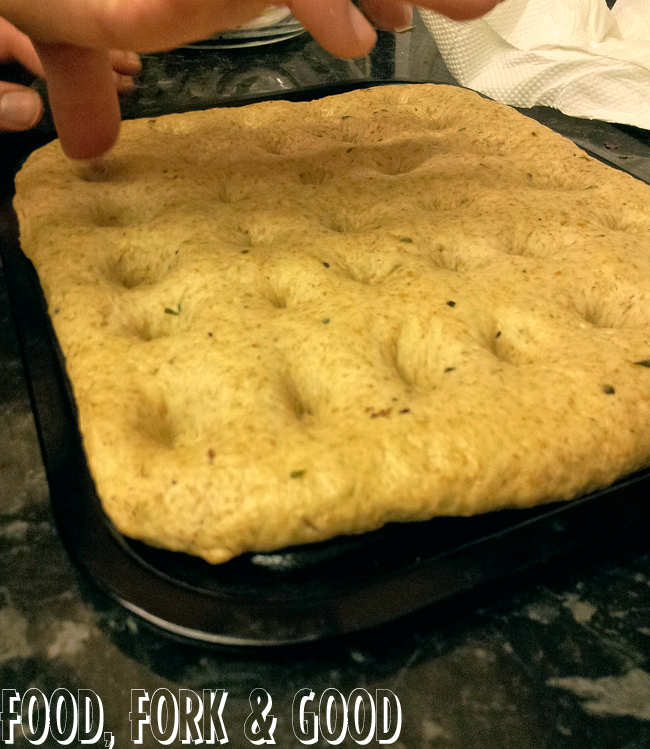 Push gently into the dough to make sure it stays. Add a bit more oil if your daring. Next sprinkle some polenta over the top (this add a bit of crunch to the top) and pop into the middle of a preheated oven (Gas mark 7, 220°C) for 25-30 minutes. It should be slightly golden, risen & cooked all the way through. This was all that was left of mine last night!